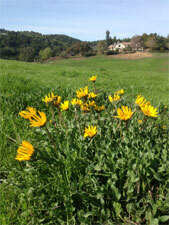 Los Altos Hills Open Space Preserves, which includes Byrne, Juan Prado Mesa, and O’Keefe Open Space Preserves, span over 100 acres of rolling oak woodland, chaparral, and grassland. Restoration efforts focus mainly on Byrne Preserve, and include controlling invasive plants in the grasslands and enhancing native vegetation along Moody Creek. Byrne, Juan Prado Mesa, and O’Keefe Open Space Preserves span over 100 acres of rolling oak woodland, chaparral, and grassland that are home to an abundance of wildlife and provide popular walking trails. Restoration efforts focus mainly on Byrne Preserve, and include controlling invasive plants in the grasslands and enhancing native vegetation along Moody Creek.